New driverless car technologies developed at a University of Delaware lab could lead to a world without traffic lights and speeding tickets. Researchers also hope the innovations will bring about the development of driverless cars that use 19 to 22 percent less fuel. Imagine a daily commute that's orderly instead of chaotic. Connected and automated vehicles could provide that relief by adjusting to driving conditions with little to no input from drivers. When the car in front of you speeds up, yours would accelerate, and when the car in front of you screeches to a halt, your car would stop, too. At the University of Delaware, Andreas Malikopoulos uses control theory to develop algorithms that will enable this technology of the future. In two recently published papers, Malikopoulos, who was recently named the Terri Connor Kelly and John Kelly Career Development Professor of Mechanical Engineering, describes innovations in connected and automated vehicle technology pioneered in two laboratories at the University, the UD Scaled Smart City (UDSSC) testbed and a driving simulator facility. "We are developing solutions that could enable the future of energy efficient mobility systems," said Malikopoulos. "We hope that our technologies will help people reach their destinations more quickly and safely while conserving fuel at the same time." Someday cars might talk to each other to coordinate traffic patterns. Malikopoulos and collaborators from Boston University recently developed a solution to control and minimize energy consumption in connected and automated vehicles crossing an urban intersection that lacked traffic signals. 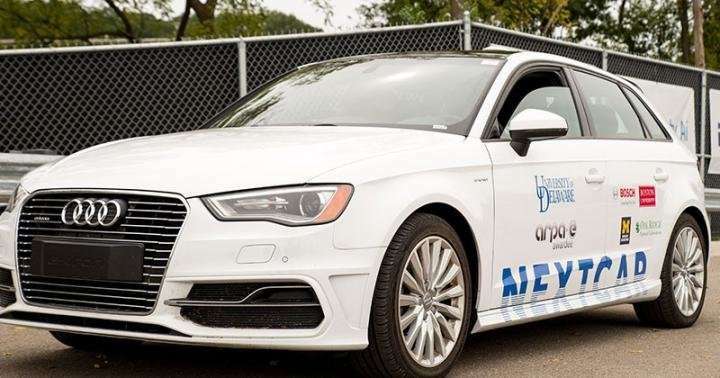 Then they used software to simulate their results and found that their framework allowed connected and automated vehicles to conserve momentum and fuel while also improving travel time. The results were published in the journal Automatica. Imagine that when the speed limit goes from 65 to 45 mph, your car automatically slows down. Malikopoulos and collaborators from the University of Virginia formulated a solution that yields the optimal acceleration and deceleration in a speed reduction zone, avoiding rear-end crashes. What's more, simulations suggest that the connected vehicles use 19 to 22 percent less fuel and get to their destinations 26 to 30 percent faster than human-driven vehicles. The results of this research effort were published in IEEE Transactions on Intelligent Transportation Systems. Malikopoulos has received funding for this work from two U.S. Department of Energy programs—the Smart Mobility Initiative and the Advanced Research Projects Agency—Energy's NEXTCAR program. Malikopoulos is the principal investigator of a three-year project funded by the Advanced Research Projects Agency for Energy (ARPA-E) through its NEXT-Generation Energy Technologies for Connected and Automated On-Road Vehicles (NEXTCAR) program to improve the efficiency of an Audi A3 e-tron by at least 20 percent. The partners of this project are the University of Michigan, Boston University, Bosch Corporation, and Oak Ridge National Laboratory. On future roadways, either overpass or underpass crossings will be needed. Traffic and pedestrians need to be separated, due to increased traffic and wider roads. This way, neither one will interfere with the other. Overpass would be better, because underpasses allow a place for "unpleasant" people to gather and cause trouble. So how do us mere humans cross the road safely ?? At major intersections you could have something like we have today. Press button to cross, wait for the WALK sign. It just sends a signals the cars instead of turning the light. It frustrates me that we have to wait for autonomous vehicles to get intelligent flow at intersections. I try to anticipate what traffic lights are doing and adjust my speed so as not to stop. I usually fail to estimate timing. What would help is signs at an appropriate distance from lights which would show an estimated "speed for green" or "prepare to stop" if there is no way one is going to make the light due to timing or too many vehicles at the light already. I don't see why we aren't making our lights much smarter now to save time and energy with no change needed to vehicles. Press button to cross, wait for the WALK sign. It just sends a signals the cars instead of turning the light. In so many places that button isn't even connected. It's just there to make the people stop and press a button, and then wait for the light to change. I can locate at least three intersections in my neighborhood where the button doesn't do anything. You spot them when you're cycling around in the middle of the night and press the button in an empty intersection - still takes a minute for the light to change. It's the same idea as with sprinkling empty speed camera boxes around - cheaper than having the real things, but still works because people don't know they're not real. Sounds like the lies a dictatorial regime would tell to force its citizens to accept the ultimate absolute control of their lives, AND to pay for the insult as well. Unless all bicycles, humans and motorcycles are fitted with autonomous driving (unlikely) I do not see traffic lights vanishing any time soon.